Left foot forward (a journey into reenactment): Oddments. A friend of mine has started supplying all manner of cutlery and plates and cups at Laura's historic homewares. One of the first things you should get hold off is something to eat and drink out of. I have also had dealings with A stitch in time, a tailoring comany that specialise in Napoleonic gear, I met one of the guys and he is familiar with most established regiments and might well know what exactly you need more than you do! Competitive prices and you can e-mail with details of what you want and get a quote. Topical but not strictly reenactmenty I recommend everyone to read about General Lasalle. 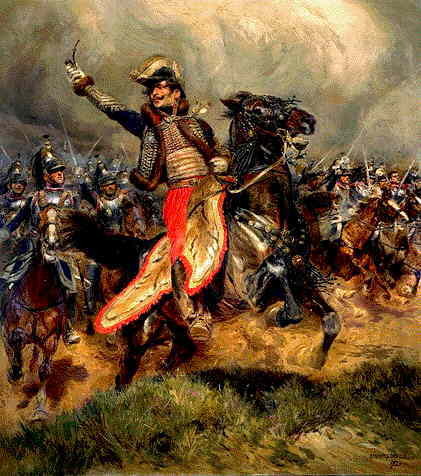 This guy is almost unbelieveable, his life reads like a work of fiction, romantic assignations behind enemy lines, bluffing armies into surrender, duelling, drinking, music making, cheeking Napoleon and generally being a rogue, but also a fantastic cavalry commander despite that. May have had my first set back in that the one day event at Dover is a real arse to get to and back on a Sunday by public transport, with engineering work on, which would make next event about six weeks away! yikes, better see if I can make some of the others.